Are the tariffs President Trump just imposed on foreign solar panels good or bad? With the bulk of news thus far outlining the negatives, as this is now a reality to deal with, we would like to share opportunities that ratepayers, solar developers, and financiers can take to de-risk their processes and continue to grow in the ever changing world of solar. We have been asked by a number of our key partners how the panel tariff will impact our business. Interestingly enough, as soon as the trade petition was filed this past year spooking the solar industry, we saw immediate affects with pricing jumping up and panel availability shrinking considerably. I see this similar to a gas station with an impending hurricane or disruption on fuel supplies: prices at the pump go up before they are actually affected. While we are certainly not excited about the tariffs, the tariffs are not nearly as high as petitioners Suniva & Solar World wanted, and we now can accept this pricing change and scale down of the tariff and not leave it up to pondering "what if" scenarios (that said, there are still opportunities to petition which countries will be included/excluded and at what levels, more on that in a minute). US DOE announces “The American Made Solar Prize” to incentive domestic manufacturing. Further details will be released in the first weeks of February 2018 about application details. 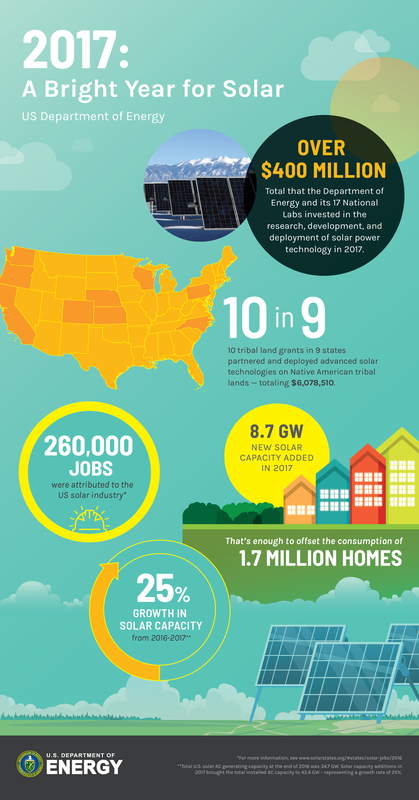 Link to the DOE’s info-graphic for solar in 2017. Domestic module producers are ramping up. While the domestic production will not be able to meet the entire need of US solar developers, we have already seen moves from Mission Energy, Solaria Corporation, and Tesla among others to increase their manufacturing capacity. Don’t expect the historic exponential cost reductions in solar when obtaining quotes for solar. A report by the National Renewable Energy Lab (NREL) published a report on 9/12/17 about the cost reductions between residential, commercial, and utility scale projects. Important to note that while certain costs have come down, it is soft costs have grown. 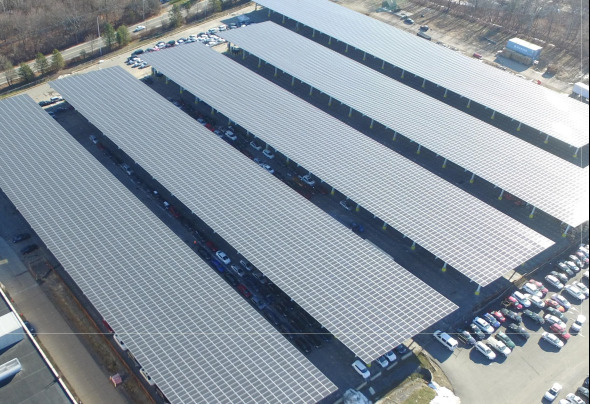 For rate payers evaluating solar, selecting a development organization that has the depth and expertise to carry out the project to meet their goals. Developers and contractors will need to run a tight ship to continue growing. As we discussed in our solar procurement webinar at the end of 2017, there are a number of solutions to increase project efficiencies and protect from panel tariffs. Access to project finance will become increasingly important since not only having panel availability constraints are affecting projects, but the recent tax law changes are reducing the tax appetite for rate payers and the corresponding tax equity certain organizations have had access to in the past. Learn more about becoming a partner EPC on our platform to access rate payers, finance, and a variety of resources that de-risk solar development. Finding solid projects developed/built by solid organizations have been the largest challenge for organizations looking to deploy capital in the solar market. We have evaluated hundreds of projects partially to fully developed that simply don’t meet financing metrics. These unprofitable projects have caused a number of EPCs to go out of business, or roll these losing projects into winning projects that drives the price up for projects that can actually get done. For organizations on the Intelligen platform, we provide a variety of measures to risk-mitigate their pipeline and process. Do you have projects in the 50-500kw range that are in need of a PPA? We have recently onboarded yet another finance option to our platform in our continued efforts to serve our developer community. Email Seth for more info. Feeling the crunch with panel procurement? We can help! Client Review: looking for a pre approval for projects in your pipeline? Gain access to 30+ financiers and 7+ solar finance products through our Client Review. Need better finance for your residential projects? We have a solar home mortgage partner that can bake the solar cost into a new mortgage or a refinance. Ask: "Who will be impacted by going solar?" Note all those that are mentioned, since these individuals are the decision makers you will need to connect with to earn the solar account at that organization. Carry out a Client Review to filter out those that are both serious and qualified to go solar to de-risk the solar sales & development for your company.